discipline | Life of an "Aamjunta"
About ten days ago, we had been to the school where our Domestic Help’s daughter sought admission for the very first time. Located in a by-lane, it is not only devoid of a playground, it is also very cramped even for little ones. For most part of the school time, children are seeing playing on the adjacent lanes and no one bothers, probably because that’s how space is managed and/or the administration is indifferent. Some children aged 10-14 years do not follow the classroom decorum !… And a few are admitted into lower classes, long past their suitable ages though they are not that ‘dumb’; reason- apparently commercial, that is, the school intends to make profits from the extra (unnecessary) years a ‘dumb’ student is made to go through ! !… Notwithstanding, most parents put their children on the rolls in such schools because it is convenient to drop-and-pick them on their way to work and these schools also happen to be on a reasonable price-list according to their ‘limited’ affordability. This by-lane school, without a playground and basic necessities, charges 6200 INR for an L.K.G. kid. More than the knowledge likely to be gained in such an environment, parents should be apprehensive of the hygiene, discipline and basic attitudinal orientations a child is going to learn here to imbibe or desert !! But unfortunately there are many such mushrooming schools in cities, towns and villages, and there seems to be no one to advise these parents who are honest and hard-working but owing to various reasons, not educated (not of formal degrees) to make out certain key differences regarding formal upbringing of children ! The family struggles and aspires- the parents are diligent, eagerly bear all financial hardships and dream to one day, see their children well-placed in the society; and the children spending their days in such schools, unknowingly waste most of their formative years that are never to be recovered. This is one of the most vital factors for a society to be good or bad, for children ultimately form the long future of a nation !!! Our Cook’s eldest son, aged about 15 years, had to change two schools over the last two years; each admission costing 65000 INR on an average; then there are other expenses too ! But however hard his parents and teachers-at-new-schools now try to discipline him, the required changes are just not coming through !! Probably, his very basic formative years were lost in the unknown by-lanes when he ought to have been sitting under the light of knowledge and beside his Guide (Teacher). It is indeed very difficult to lead or help a budding youth emerge from such troubled waters. To make matters worse, their parents start fearing a fading dream and non-refundable or non- reimbursable schooling expenses met from hard-earned savings ! We also gathered information regarding management and curriculum of ‘established’ schools of our nephew (city-1), our niece (village) and our friends’ kids (town-1 and town-2); we spoke to a few other parents and guardians too; and additionally, we took a brief look at various initiatives by some NGOs, Government schemes, etc. 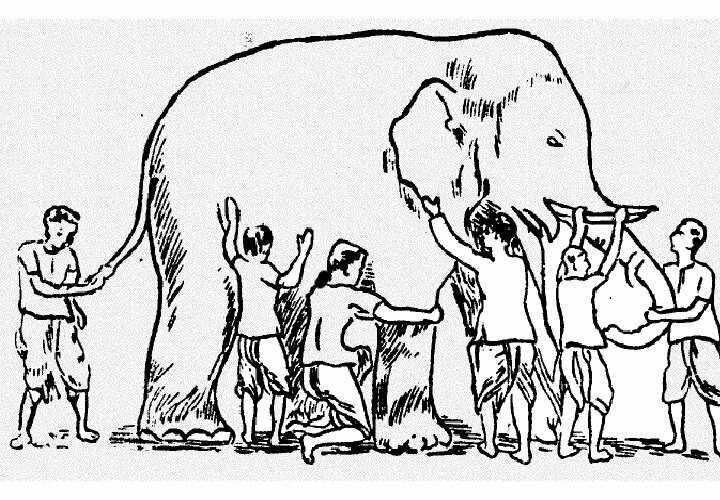 Someone gets hold of the ear of the elephant and says ‘education is like a big jute dust-pan’; someone hangs by the tail and says ‘its like a small, smooth rope’; someone leans on the legs and says ‘its like a tall pillar’; someone grazes at the belly and says ‘its like a huge wall’; someone sits atop the back and says ‘where’s the pain, its an easy ride’; etc. But usually, no one looks at the elephant or tries to even realize its presence, let alone providing any substantial financial or logistical assistance !! So the consequence is that everyone, especially children and youth, continue to suffer because we do not take a HOLISTIC approach to address the issues in the entire system; we try to resolve merely by fits and starts, and a bit here and a bit there… Sometimes, for mere sake of promotions, sometimes for only political gains and sometimes, even without understanding an iota of it !!! Some parents and guardians send their kids to schools without verifying necessary facts or keep changing schools without really monitoring their children’s progress and reasons for their inadequate performances. In most of these cases, parents and guardians remain all occupied at work during the week and therefore, prefer to simply unwind over the weekend along with family; they just admit their children on school rolls because they do not want to miss out on this ‘prime duty’ towards their children. But after that, the required follow-up usually does not happen ! Well, we spend thousands of crores of INR in election campaigns, day-to-day advertisements and mere social events; then why don’t we do it for completely redefining the Education System in the country ? Isn’t that the best gift we can give to our children, to our nation and to the world at large ? Wonder when shall modern India rebuild or transform itself to once again become the marvellous hub of Education that it was in the ancient days…… Let’s not forget that there was a great time when the whole world was eager and humble to visit the unparalleled chambers of wisdom at Nalanda, Taxila (now in Pakistan), Vikramsila, Varanasi, Udaygiri, Ratnagiri, Pusphagiri, Kanchipuram, Manyakheta, etc. Name the Subject and Seek the Master- ancient India had it all to its glory !